Sweetheart Skate at the Rothman Institute Ice Rink! The Rothman Institute Ice Rink is one of the most romantic locations to celebrate Valentine's Day! Skate to your favorite love songs, presented by a live DJ, and dedicate a tune to your sweetheart. There will be complimentary hot chocolate and flowers, plus free photo keepsakes in the Lovers Photo Booth. The $20 per person includes: admission, skate rental, hot chocolate and giveaways. Tickets are available online. Plus, the Rothman Cabin provides a cozy location for you and your date to enjoy cocktails and a bite before or after skating, including a Sweetheart Skate special of churros with Mexican chocolate sauce. Sweetheart Skate is presented by Whole Foods Market. The Bacon Brothers are playing a special show on February 4 at Union Transfer to support the construction of Phase I of the Viaduct Rail Park! Rob Grote of The Districts is opening with a special solo set and the whole thing will be emceed by WMMR's Pierre Robert. Get your General Admission tickets right now! Proceeds benefit Phase I of the Park, a Center City District-managed project, carried out in partnership with the City of Philadelphia and the Friends of the Rail Park. Following the concert, the good folks at Brick & Mortar are hosting an after-party and are offering each ticket holder one of a selection of free drinks. Thanks to our sponsors: Univest, Cheshire Law Group, Poor Richard's Charitable Trust, Victor Keen & Jeanne Ruddv, The Logan, Union Transfer, 13th St. Kitchens and Origlio Beverage. 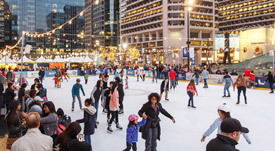 The Rothman Institute Ice Rink at Dilworth Park is open every single day on the west side of City Hall! Admission is $3 for children ages 10 and under and $5 for adults. Skate rental is $9. Plus, the Rothman Cabin is steps away from the rink with tasty food and drink from Rosa Blanca Café. The Rothman Institute Ice Rink is sponsored by Rothman Institute, PNC Bank, 6abc, and Temple University Center City. Visit DilworthPark.org/rothmanicerink for hours, events, rental information, and more. The Rothman Institute Ice Rink at Dilworth Park is offering a special thank you to all first responders on February 21. From 1-4pm, get free admission* with purchase of skate rental for up to four people and a 10% discount off menu items inside the Rothman Cabin with presentation of badge or active military ID. Enjoy community outreach, interactive activities, and entertainment from Philadelphia Police and Fire Departments, along with safety and fire prevention information for all visitors. *$1 off skating admission for up to four people available for first responders, 11am-1pm and 4-8pm. On February 6, Jen Childs, artistic director of 1812 Productions, hosts a special benefit for the Take Flight Scholarship Travel Program at the Independence Charter School. She will be in character as Patsy, the South Philly politico from Shunk Street, a fan favorite. Patsy will team up with several students for a curriculum that includes "Are You Smarter Than a 7th Grader?" and "Middleschoolers Say the Darnedest Things." Beat the bell and take your seat as Patsy rewrites history and gives history lessons South Philly style. Come to the Alliance Française de Philadelphie on February 9 to celebrate Mardi Gras, Cajun culture and zombies. Learn about the origin of zombies from the French Caribbean and enjoy Lousiana cuisine, complete with king cake. Dance to 1920s jazz and enter the raffle! Also? A zombie costume contest! To register, call 215.735.5283. People enjoyed it so much last year, that The Shops at Liberty Place are bringing back their Pop Up Garden in the Rotunda. The garden is due to arrive in mid-February. Go to ShopsAtLiberty.com for more information about the garden and other events. The Philadelphia Film Society’s series, The Graveyard Shift, is a late-night feast of horror, action, suspense, and the downright weird. On February 16, they’re showing the 1960 classic Black Sunday, director Mario Bava's story of witchcraft, revenge and vampirism. And February 19-21, there’s more eternal love – undead style – with The Hunger, a bloody love triangle featuring vampire David Bowie. In observance of African American History Month, the City of Philadelphia Mural Arts Program is partnering with the African American Museum of Philadelphia to offer a special mural trolley tour of the Albert M. Greenfield African American Iconic Images Collection. This rich collection of images gives a visual autobiography of Philadelphia and of iconic African American figures of the past and present. Tours will begin and end at the African American Museum of Philadelphia on 701 Arch Street, February 6 & 21. The cost of the tour includes same-day admission to the Museum. Advance tickets required. To purchase tickets please visit MuralArts.org/tour or call 215.925.3633. Tickets are $32 for adults, $30 for seniors, and $28 for children ages 3-12.